Normal approach and letdown on the ILS is divided into two distinct stages: the instrument approach stage using only radio guidance, and the visual stage, when visual contact with the ground runway environment is necessary for accuracy and safety. The most critical period of an instrument approach, particularly during low ceiling/visibility conditions, is the point at which the pilot must decide whether to land or execute a missed approach. As the runway threshold is approached, the visual glidepath separates into individual lights. At this point, the approach should be continued by reference to the runway touchdown zone markers. 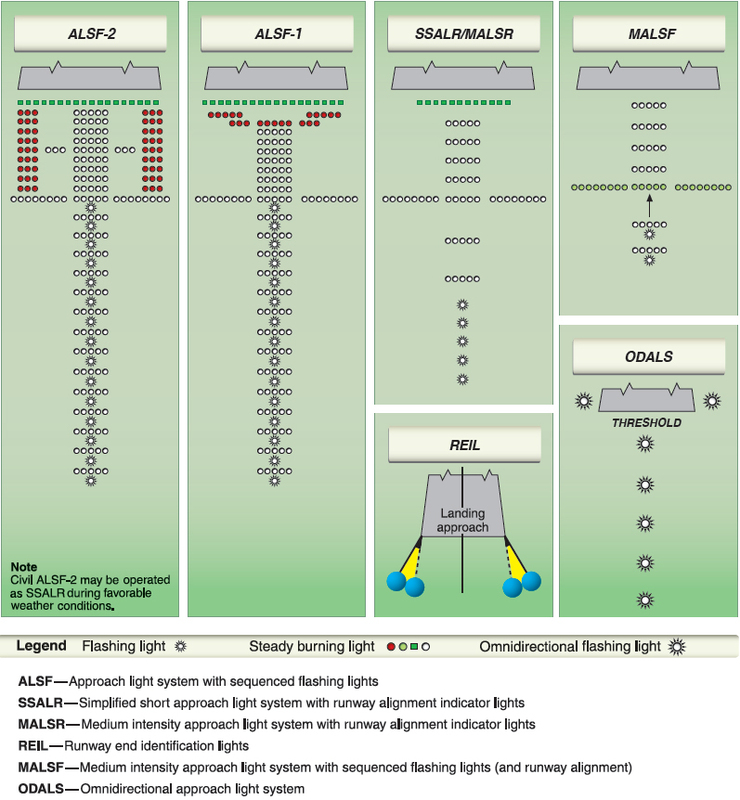 The approach lighting system (ALS) provides lights that will penetrate the atmosphere far enough from touchdown to give directional, distance, and glidepath information for safe visual transition. Visual identification of the ALS by the pilot must be instantaneous, so it is important to know the type of ALS before the approach is started. Check the instrument approach chart and the A/FD for the particular type of lighting facilities at the destination airport before any instrument flight. With reduced visibility, rapid orientation to a strange runway can be difficult, especially during a circling approach to an airport with minimum lighting facilities or to a large terminal airport located in the midst of distracting city and ground facility lights. Some of the most common ALS systems are shown in Figure 9-36. A high-intensity flasher system, often referred to as “the rabbit,” is installed at many large airports. The flashers consist of a series of brilliant blue-white bursts of light flashing in sequence along the approach lights, giving the effect of a ball of light traveling towards the runway. Typically, “the rabbit” makes two trips toward the runway per second. The visual approach slope indicator (VASI) gives visual descent guidance information during the approach to a runway. The standard VASI consists of light bars that project a visual glidepath, which provides safe obstruction clearance within the approach zone. The normal GS angle is 3°; however, the angle may be as high as 4.5° for proper obstacle clearance. On runways served by ILS, the VASI angle normally coincides with the electronic GS angle. Visual left/right course guidance is obtained by alignment with the runway lights. The standard VASI installation consists of either 2-, 3-, 4-, 6-, 12-, or 16-light units arranged in downwind and upwind light bars. 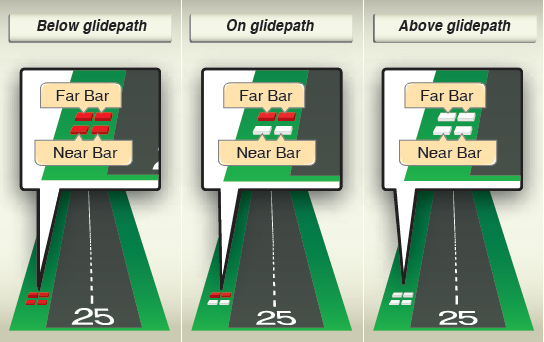 Some airports serving long-bodied aircraft have three-bar VASIs that provide two visual glidepaths to the same runway. The first glidepath encountered is the same as provided by the standard VASI. The second glidepath is about 25 percent higher than the first and is designed for the use of pilots of long-bodied aircraft. The basic principle of VASI is that of color differentiation between red and white. Each light projects a beam having a white segment in the upper part and a red segment in the lower part of the beam. From a position above the glidepath the pilot sees both bars as white. Lowering the aircraft with respect to the glidepath, the color of the upwind bars changes from white to pink to red. When on the proper glidepath, the landing aircraft will overshoot the downwind bars and undershoot the upwind bars. Thus the downwind (closer) bars are seen as white and the upwind bars as red. From a position below the glidepath, both light bars are seen as red. Moving up to the glidepath, the color of the downwind bars changes from red to pink to white. When below the glidepath, as indicated by a distinct all-red signal, a safe obstruction clearance might not exist. A standard two-bar VASI is illustrated in Figure 9-37. Figure 9-37. Standard two-bar VASI. Airborne equipment for the ILS system includes receivers for the localizer, GS, marker beacons, ADF, DME, and the respective indicator instruments. The typical VOR receiver is also a localizer receiver with common tuning and indicating equipment. Some receivers have separate function selector switches, but most switch between VOR and LOC automatically by sensing if odd tenths between 108 and 111.95 MHz have been selected. Otherwise, tuning of VOR and localizer frequencies is accomplished with the same knobs and switches, and the CDI indicates “on course” as it does on a VOR radial. Though some GS receivers are tuned separately, in a typical installation the GS is tuned automatically to the proper frequency when the localizer is tuned. Each of the 40 localizer channels in the 108.10 to 111.95 MHz band is paired with a corresponding GS frequency. When the localizer indicator also includes a GS needle, the instrument is often called a cross-pointer indicator. The crossed horizontal (GS) and vertical (localizer) needles are free to move through standard five-dot deflections to indicate position on the localizer course and glidepath. When the aircraft is on the glidepath, the needle is horizontal, overlying the reference dots. Since the glidepath is much narrower than the localizer course (approximately 1.4° from full up to full down deflection), the needle is very sensitive to displacement of the aircraft from on-path alignment. With the proper rate of descent established upon GS interception, very small corrections keep the aircraft aligned. The localizer and GS warning flags disappear from view on the indicator when sufficient voltage is received to actuate the needles. The flags show when an unstable signal or receiver malfunction occurs. The OM is identified by a low-pitched tone, continuous dashes at the rate of two per second, and a purple/blue marker beacon light. The MM is identified by an intermediate tone, alternate dots and dashes at the rate of 95 dot/dash combinations per minute, and an amber marker beacon light. The IM, where installed, is identified by a high-pitched tone, continuous dots at the rate of six per second, and a white marker beacon light. The back-course marker (BCM), where installed, is identified by a high-pitched tone with two dots at a rate of 72 to 75 twodot combinations per minute and a white marker beacon light. Marker beacon receiver sensitivity is selectable as high or low on many units. The low-sensitivity position gives the sharpest indication of position and should be used during an approach. The high-sensitivity position provides an earlier warning that the aircraft is approaching the marker beacon site.